Prepare for a thriller, supernatural entity CGI-less creeper on steroids . 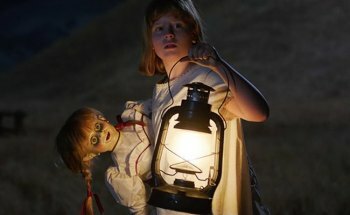 Swinging back to the 1940 and 1950s , "Annabelle: Creation" continues a plainly presented supernatural possession revived by a string of eerie venue manipulations ( "Conjuring," "Sinister," "Ouija") which resurrect a more traditional haunted house infested by the demonic but welding many dark spaces, locked doors, hidden rooms, a creaky dumbwaiter, impaired chair lift and dusty curtains. My original "Dark Shadows" following experience can not help but equate minimal parallels to David Collins and Sarah Collins (an eleven year old ghost whose appearances often assisted David and proverbial damsel in distress Maggie Evans from evils). "Creation" has an ensemble of youthful orphan damsels avoiding supernatural woes. Twelve years after losing their daughter Bee in a car accident, Samuel Mullins (Anthony LaPaglia) and his wife, Esther (Miranda Otto) open their ornate, but heavily musty and gothic inspired, farmhouse to Sister Charlotte (Stephanie Sigman), and a group of orphan girls. 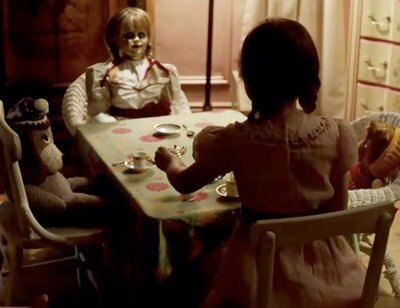 Janice (Talitha Bateman) commits the unpardonable sin and opens the door (assisted by mysterious handwritten messages) to Bee's room where the doll Annabelle rests. Playing her best friend, Linda, is Lulu Wilson who exudes a miraculous innocence which bonds well with the slow possession of Janice. David (Lights Out) Sandberg utilizes a string of jump scares that will have squeamish jolting often from comfortable --- now seemingly electrified --- seats. He often telegraphs the frights to come, but has a knack for streaming false set-ups, which maintain suspense, even as the story itself beams with well worn cliches that Sandberg creatively reinvents. One of those sleights of hand concerns the doll itself. Is it or is it not the dwelling spot of the dark evil? Sandberg offers venue variations of scares so you have doubts that the doll itself is the (pardon the pun) sole source of the would-be soul stealing presence. "That is the aesthetic that I feel like I've set up … and I really want to keep that classical sort of old-school storytelling going on with all these films," says Wan. "Those are the kind of horror movies that I really love, and so I want to make sure that all these films within the Conjuring world feel like they came from the same place. I don't want them feeling too disjointed from a visual standpoint."